stand-alone, no need to attach to stool or chair. 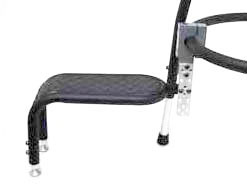 and our versatile foot-support attaching to all models of bass chair/stools. IMPORTANT – Fact sheet for C4 AND C5 ‘gig’ basso stools and information about custom design. New from Concert Design. “Solo” stand-alone foot-support. No need to attach. Bassists will find this invaluable. Also useful for guitar. * Height Range: extensions are available at various lengths for heights up to 16″ or more. * Dimensions: 12″ top x 8″ wide; footprint: 18″ length x 10″ wide. 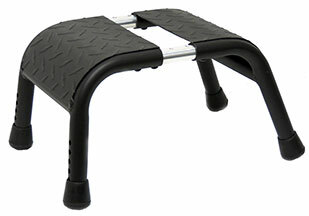 * Weight: Solo foot support with solid aluminum extensions and swivel glides weighs 2.8 pounds. * If rubber crutch tips are used (extensions removed), weight is 2 pounds. * If less than 8″ height is desired, the Solo frame is cut to height required. Speak with Sal Porretta by Skype or Facetime for demonstration of these features. A new feature – dimensions of Solo foot support reduced for individual preference, as shown in pictures below. Same height ranges as given above. 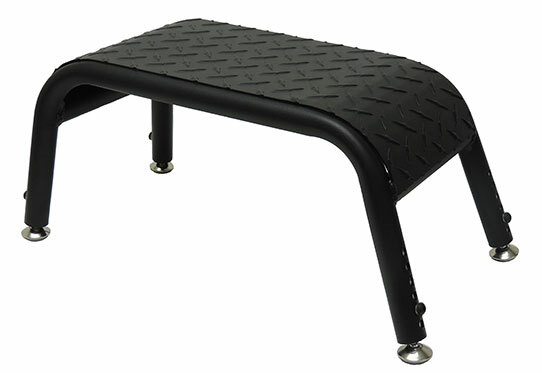 Our standard aluminum foot-support with PVC bracket attached to leg of C4 or C5 ‘gig’ basso. * Dimensions: 7.5″ high, 5.5″ wide, 14.5″ long. 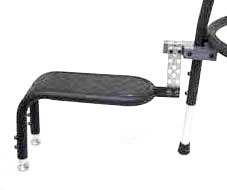 * Weight: the standard foot support with solid aluminum extensions, swivel glides, PVC clamp and 5″ adaptor bar weighs 2.2 pounds. * Height: the extensions are available at various lengths to increase the height range, generally 7″-9″. Leg extensions of stool are adjusted for taller stool position. 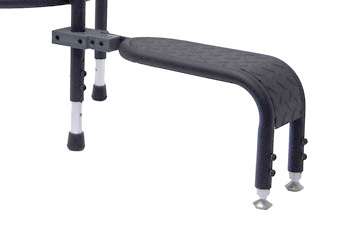 PVC clamp for aluminum foot-support attached to leg of stool with 5″ adaptor bar (included). Leg extensions of stool adjusted for taller stool position. PVC clamp for aluminum foot-support attached to ring of stool with 5″ adaptor bar (included).